Genetics, agronomics and better practices are all coming together in the grain corn industry in Western Canada. A yield competition sponsored by the Manitoba Corn Growers Association (MCGA) seems to grab headlines each fall with a new record. Behind that, though, are real returns that are getting better and better. The perennial winner, or close competitor, is Baker Hutterite Colony of MacGregor. It set a record yield, for a hand-picked 50-foot row sample, of 271.69 bushels per acre in 2013. The colony also has won that competition four other times in the past few years, including 2016. The real field and farm averages are much different, and climbing quickly. According to crop insurance reports to the Manitoba Agricultural Services Corporation, the average grain corn yield has climbed from 113 bushels per acre a few years ago to about 141 in 2016, or 25 per cent. That’s in line with Myron Krahn’s numbers. Krahn is a seed grower with about 800 acres of dryland corn, plus cereals, soybeans, hempseed and grasses. He’s also president of the MCGA. “Our average crop has gone up by about 40 bushels an acre over the past five or six years, the same as the rest of the province,” Krahn says. “It is a huge increase, and it sounds unbelievable, but lots of farms have gone through this in the past decade,” he says. Seeded acres of corn haven’t really kept up with the yield growth. Production acres are around 300,000 to 350,000 each year. But there is growth. However, he added, all producers in Manitoba are enjoying the blessings of better genetics, better agronomics and better practices, leading to bin-busting yields. Scott McIntosh, DuPont Pioneer account manager for Manitoba, agrees with Krahn. He’s seen it, and he is confident that the peak of prairie corn production is yet to be found. Krahn says veteran corn growers now target a 150-bushel yield. That compares to 80- to 100-bushel corn twenty years ago. The rule of thumb he uses is that each bushel will need to use one to 1.2 pounds of nitrogen. He budgets for supplying up to 170 pounds of nitrogen – but he doesn’t put it all on at once. “A lot of producers are fertilizing throughout the season. That allows you to observe the quality of the crop and the potential as it grows. In June and July, as you see the potential getting higher, you start adding more fertilizer. On the other hand, if it’s half-way through June and half your fields are drowned, you don’t have to put all that fertilizer down,” Krahn says. Precision planting tools also are part of the explanation for higher yields. Rows are uniformly spaced, and seeds are uniformly spaced. Fertilizer is precision-placed two or three times in a season, and it is packaged in forms that release it slowly to the eager plants. “We know more about targeting nitrogen. It’s almost like spoon-feeding the crop. The standard now is twice, and some do it three times,” Krahn says. McIntosh describes a new technology for applying fertilizer. “A lot of growers have purchased or made their own Y-drop system in the past two or three years. It allows a grower to run liquid 28 fertilizer along the ground, below the canopy, without burning the plants,” McIntosh says. The new system was developed by an American company called Yield 360, he says. McIntosh explained that with a separate boom, mounted on a precision-guided sprayer, hoses hanging below the boom can dribble the liquid fertilizer beside the plant rows and feed the roots, quickly and without trampling. Another contributor to the higher yield is a higher plant population. “We are definitely seeding populations that are quite a bit higher than back in my father’s day. That’s translating into yield,” Krahn says. Thirty-inch row spacing still is standard in Manitoba, but not always. One more contributor is improved field drainage. Water is one of the biggest factors in the growing season. One year there isn’t enough; the next may have excess. 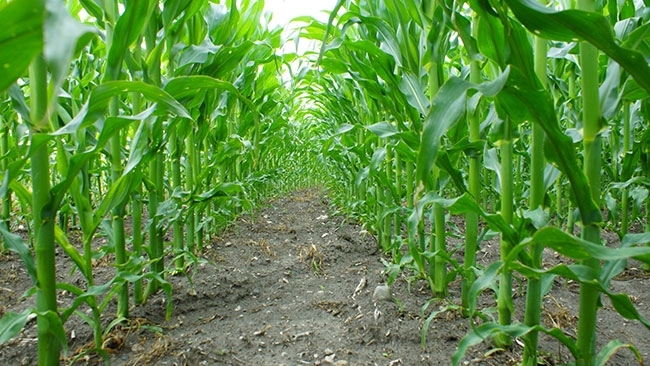 New genetics help today’s corn to use more fertilizer than ever before. The new high-yielding varieties can mature with less heat and with fewer days of growth. McIntosh agrees. “The biggest opportunity is in the genetics. Over the last 10 years we’ve seen a big increase in genetic potential. Even yearly, we see improvements. And, another reason we see more yield is that tolerance to certain stresses has been much improved. New lines during development are evaluated by the plant breeders for characteristics like tolerance to dry, wet or windy conditions, as well as yields and disease resistance. And, they’re evaluated in trials with close proximity to the primary growing areas, enabling growers to be more successful in selecting the lines that are best adapted locally. As well, genetically modified corn has been a big boost to yields – by early protection from weed competition. Today’s corn gets off to a cleaner start than ever before, free of weed stress that was a yield-robber. “If we can add, over five years, four or five bushels across the provincial average for crop insurance, that would be great. I’d like to think that, in 15 or 20 years, we might be averaging 170- to 180-bushels per acre on a regular basis,” McIntosh says. “In the corn competition, we probably will see 300 bushels per acre – but that’s not representative of a whole field,” Krahn adds. On yield maps right now, the corn grower’s monitors often record spots with a rate of more than 200 bushels per acre. “I’m thinking we probably will be targeting 175 bushels, at some point, and the potential for more is there, no question about it,” Krahn says.